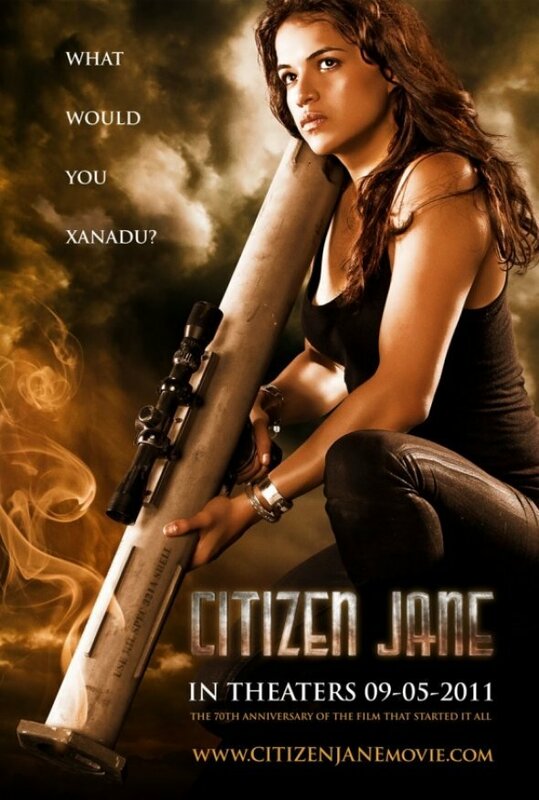 I don't really know how to break this to you kindly, so I'm just going to come out and say it: Michelle Rodriguez is remaking Citizen Kane, it's going to be called Citizen Jane, the tagline is "What Would You Xanadu?" and in the teaser trailer she says "I would do anything for my Rosebud." Actually, how about you watch the teaser trailer right now and I'll meet you on the other side so we can wrap our heads around this. Apparently they're been promoting this film pretty heavily at Fantastic Fest down in Austin, where the genre-friendly crowd would be sure to lap up Michelle Rodriguez shooting a machine gun amid some cheesy CGI. According to Slashfilm the teaser poster has popped up all over town and even on chairs before a big Fantastic Debates event. The film is scheduled for release on September 5, 2011, which is not only the 70th anniversary of Citizen Kane's premiere, but Labor Day-- a traditionally dead spot in the release calendar when a studio might just be crazy enough to release Michelle Rodriguez's Citizen Kane remake. I mean, Machete happened-- how big a leap is this really? Check out the teaser poster below, visit the official site if you dare, scratch your head along with me, and then thank God for Michelle Rodriguez, who continually proves that she'll do whatever the hell she wants, and at least some of you will pay to witness it.